During our time on the beautiful garden isle of Hawaii, we rented a car and drove along the coast – from Poipu on the South Shore to Princeville on the North Shore. Before beginning our journey, we ate breakfast at Kalaheo Coffee Co., and stopped along the way for lunch in Hanalei. We spotted a sign for ‘fresh tacos’ and pulled over to dine at Tropical Taco. 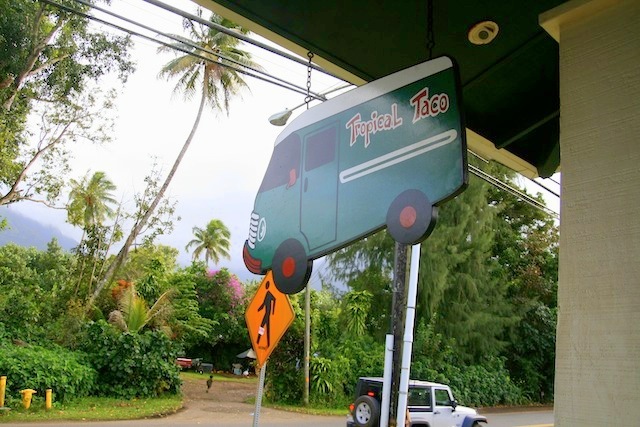 Before opening Tropical Taco, owner Roger Kennedy, used to sell tacos out of his green “taco wagon” that he’d park along the road. Now, this permanent restaurant is located in the Halele’a Building in Hanalei Town, in Kauai. Tropical Taco cooks up deliciously tasty tostadas, tacos, quesadillas, and burritos, and only uses the freshest ingredients. We enjoyed our Mexican bites while sitting along their lovely outside lanai, people-watching and taking in the beautiful surroundings. Read our complete review of Tropical Taco here.